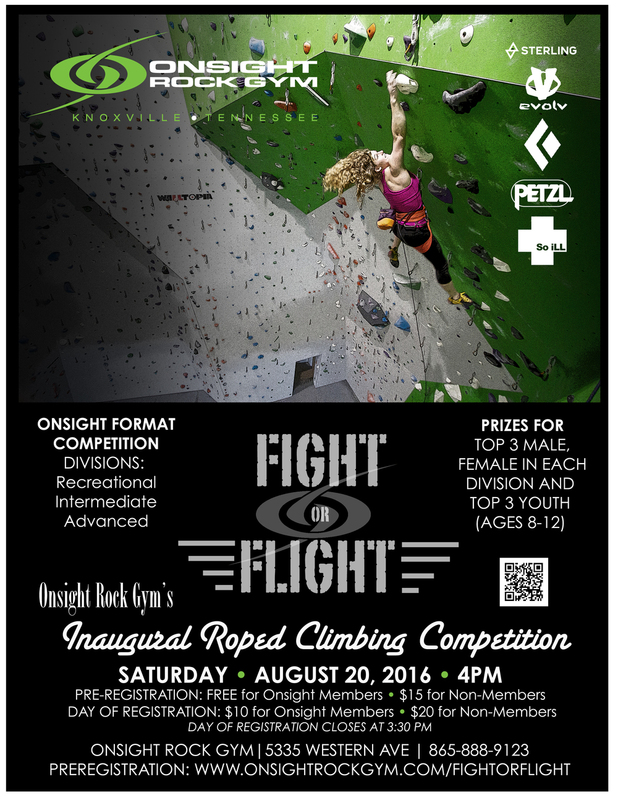 Fight or Flight 2016 from Onsight Rock Gym on Vimeo. Thanks to EVERYONE for an amazing comp. We couldn't have asked for a better turnout from the climbing community! Give yourselves a hand...you guys are AWESOME! It can only get bigger and better from here. And...the scores are IN!! The way scoring worked is that each hold and each clip were worth a certain number of points. The harder the climb within each division, the more points each hold was worth. So, the higher you got, the more points you received. Bonus points were award for each onsight send of the route (again, the harder the climb within each division, the more bonus points you received). In the Advanced Division, top 3 male and female qualifiers went on to compete in the Super Finals to determine the final placements. Competitors: You all showed great sportsmanship and tremendous effort, strength, and determination. We applaud all of you for making this competition a huge success. We hope you had a blast because we sure did! FREE PIZZA from Sergeant Pepperoni's for competitors! FORMAT: Onsight - One try. No beta. Fight the pump or take flight. Lead Climbers who are NOT lead certified at Onsight must either have a lead certification at another gym OR be USAC certified in order to lead climb at Onsight. Lead Belayers who are NOT lead certified at Onsight must come in early before the comp to take our lead certification test in order to belay at the comp. We will have top rope and lead belayers on staff during the comp to belay those who need a belayer. You are welcome to BYOB (Bring Your Own Belayer) as long as he/she is lead belay certified at Onsight. REGISTER FOR THE FIGHT OR FLIGHT COMP!